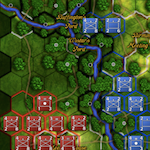 On our drive from St. Louis on our way to Nashville, my daughter and I took the scenic route through Shawnee National Forest in southern Illinois before riding the free ferry from Cave In Rock across the Ohio River to Kentucky. 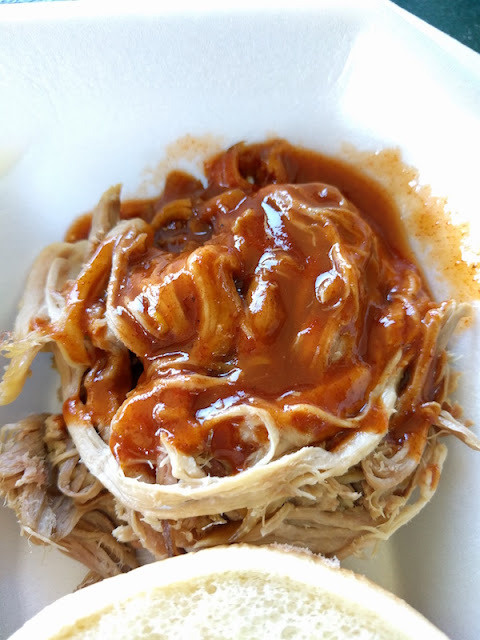 Waiting for us near the Kentucky border was some of the best BBQ that I've ever had. Marion is a small town in Kentucky's Amish farm country. A stroll along downtown is like stepping back in time. Marion is still a lively place and bustling community. 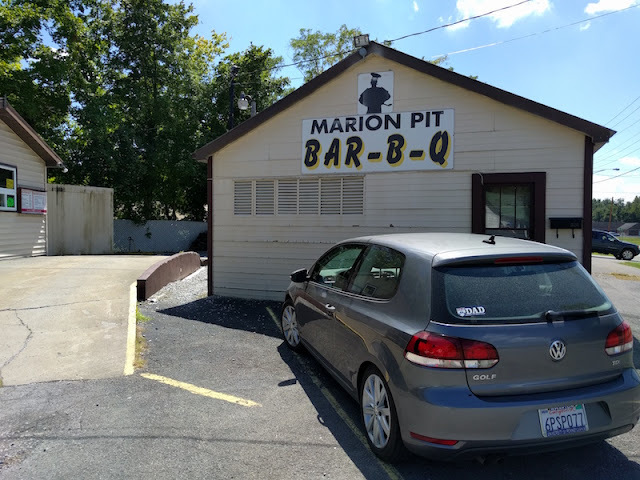 As you head south from downtown, you arrive at Marion Pit Barbecue. 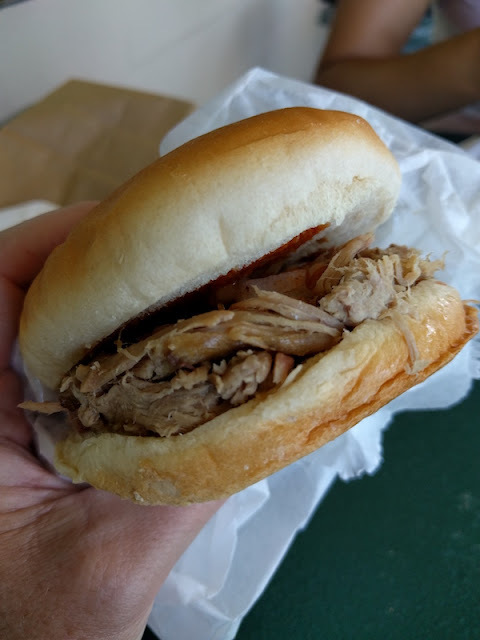 It isn't a whole lot more than a couple of shacks that have been built up into a year-round business, with a screened outdoor area with picnic tables. I love the massive ramp leading up to the drive-thru window. The pickup trucks coming to pick up their grub had to approach it pretty carefully to avoid driving into the pickup window. 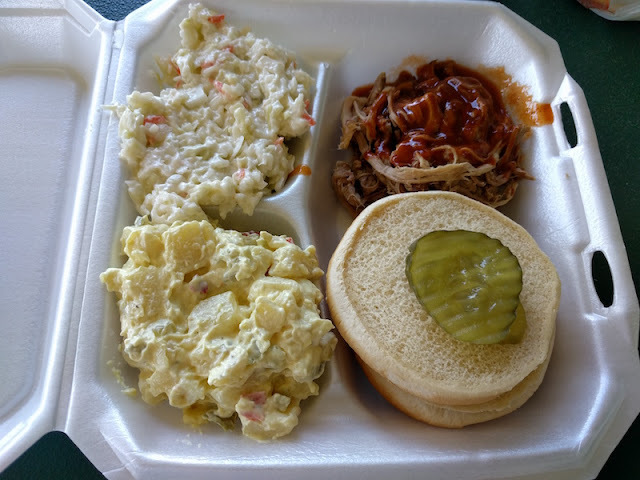 We had the pulled pork sandwich with coleslaw and potato salad. The meat was tender and full of hickory smoked flavor. The sauce is tangy and just a little spicy. It's delicious.